Quality monuments since 1952—we have been in business for over six decades because we are the best! We are a family business and we take pride in living up to the reputation that our founder, Anthony “Tony” Sciolto Sr., has created through his many years of hard work and dedication to building up the monument shop that is here to serve you today. We are thankful and feel blessed to have him still working here with us every day at 98 years old! Prices are lower than “online monuments” because we install your monument, you have no delivery/installation fees. Please call or stop by for a no-obligation consultation and quote. Select In-Stock Stones Sale: We are clearing out some of our inventory to make room and have many in-stock stones available for $100-$1,500 off original prices. Flat Marker clear-out: We have a selection of flat markers at $50-500 off original prices in order to clear out inventory. 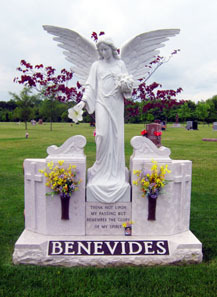 Many display markers with designs are now only $500 (includes adding one name & dates and delivery to local cemeteries). Please ask and we will be happy to show you which ones are discounted. Contact us for details on these sales or any other questions you may have.